The alarm system may be armed in the “Away” or “Stay” mode. Once the system is activated, each monitored zone has the ability to recognize a violation. 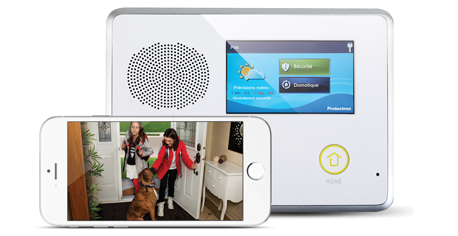 Once a zone has been violated, the alarm system then dials ADT and transmits the message through a telephone line. Once the signal is received, the alarm system will wait to send another message if another zone is tripped. Entering the code and turning off the system will end this process. Is it possible that my motion sensor will provide false detections? A false detection could be caused by the movement of objects such as balloons, blinds, and curtains within the range of a motion detector. If false alarm activations continue the motion detector may require relocation or adjustment by an ADT technician. What happens when I press the panic or fire alarm buttons on the touchpad? If you hold down the panic or fire alarm buttons on the touchpad for 1 to 3 seconds, an alarm is transmitted to the ADT Customer Monitoring Center, and emergency services are dispatched immediately. An alarm received in this manner cannot be canceled. In case of lose power, will my alarm system still work? Yes. In case of a power loss, the back-up battery will activate to maintain your alarm protection for several hours. In the event your battery is low, a low-battery signal will be sent to your Customer Monitoring Center so you can be notified. What is the process to change the people listed on my call list? Just call the ADT Customer Monitoring Center) with your changes. Have your personal identification code ready in order to make your changes. Make sure to tell everyone on your call list what to do in case they receive a call from ADT. Why should I have people listed on my call list? Have an access code to arm and disarm the alarm system, and a PIN to identify themselves. No. If you have an emergency, call 911 first. If you are unable to call 911, then depress the panic or fire alarm button on your touchpad, and ADT will request emergency services. What does Monitoring Stations do? When a monitored security system is activated, it is connected to a monitoring centre via the phone line (for hard wire) or GSM (for wireless customers. If a detector goes off while the system is activated, the phone line or GSM automatically sends a signal to our monitoring centre. Is the security system linked to a police station? How do I avoid paying a fee for having the police respond to a false alarm? Many municipalities now charge fees when police are dispatched to respond to false alarms. By-laws vary from one municipality to another. Check with your municipality to find out about current by-laws. Be sure that all system users have a good understanding of how to operate the system. Avoid leaving objects in the home that could move or blow about and set off an alarm. Pets can be given free reign of the home as long as proper motion detectors are in place. To avoid high dispatch fees, ADT offers a Guard Service (available in most regions). When an alarm is triggered, ADT will dispatch a uniformed guard to the premise to assess the situation and take the necessary measures. Only ADT has six company-owned Monitoring Centers that provide you with 24/7 fast response. ADT is the largest company of its kind in both the U.S. and Canada.